"The attention-grabbing performance seems to have created confusion in, of all places, Israel. Mr. Netanyahu’s bomb was divided into sections marked 70 percent and 90 percent, representing the progress Iran has made, and is expected to make, toward amassing enough enriched uranium for a bomb, Israeli officials and experts said. Mr. Netanyahu drew his red line at 90 percent, asserting that the Iranians would be 90 percent along the way by next spring or summer. But on Friday, Yediot Aharonot, a popular newspaper, published a drastically different interpretation. 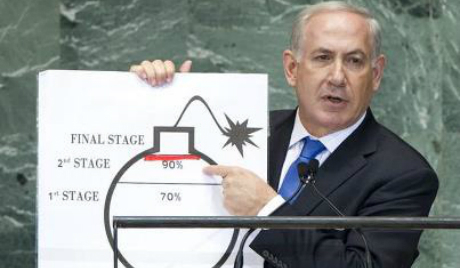 It assumed, erroneously, that Mr. Netanyahu had been referring not to progress made by Iran, but to actual percentages of uranium enrichment in his diagram, now known as the “Bibi Bomb,” a reference to Mr. Netanyahu’s nickname."